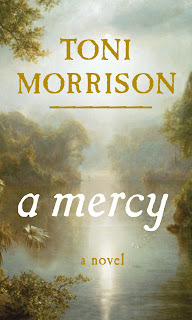 Written in stream of consciousness, Toni Morrison’s A Mercy (2008) exposes the life experiences of four women (all orphans), and how they became associated on the Vaark plantation. “Together, by trial and error they learned,” but with Jacob Vaark newly deceased, the structure within the community they built on the plantation crumbles; as each woman must find her voice or at least attempt. As they communicate their personal idea of America, all the stories intertwine and intersect at one point—the Vaark plantation, yet no character’s arrival on the plantation is as unusual as Sorrow’s. Sorrow is the only character in the novel who refuses to conform to the American way of life, and marches to the offbeat of her own drum. The women in the novel speculate that it is because she has lived at sea and groomed “to be a crewman-to-be. Dirty trousered, both wild and obedient with one important skill, patching and sewing sail cloth” that she does not fit in; but, it is when she descended from the ship “the earth—mean, hard, thick, hateful—shocked her” this was not her home. Sorrow, despite having loss all identity and former ways of living, is the only character in the story who finds happiness in new life. The Mistress bitter from losing her husband, the Native American woman Lena angry from losing her former lover/master, and Florence “had turned feral” from the wounds of slavery, while Sorrow, whose name brings grief finds contentment.